Human beings are notoriously bad at making decisions. We seem to struggle with this in both our personal and professional lives. Forty-one percent of first marriages end in divorce. Forty-four percent of lawyers would not recommend a career in law to young people. Eighty-three percent of corporate mergers and acquisitions fail to create any value for shareholders. 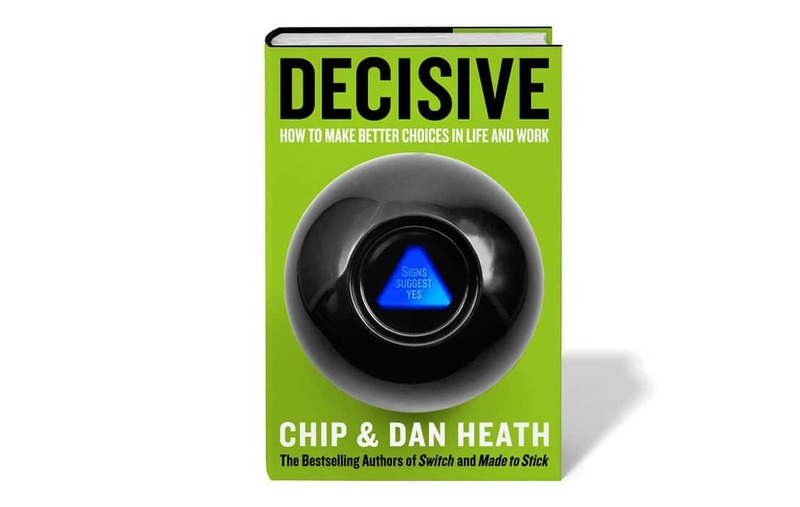 According to bestselling authors Chip Heath and Dan Heath, “When it comes to making decisions, it’s clear that our brains are flawed instruments.” Whether we rely on complex analysis or gut reactions, the results are about the same. Unfortunately, merely being aware of these shortcomings doesn’t fix the problem, any more than knowing that we are nearsighted helps us to see. The real question is: How can we do better? That’s why the Heath brothers wrote their new book, Decisive: How to Make Better Choices in Life and Work. I spent this last weekend reading it. The authors refer to this as the WRAP Process from the first letter of each step. By the way, these four steps are sequential—you do them in order. And the more you employ this process, the better you get at it. With enough practice, it becomes second-nature. In typical Heath brothers style, the book is filled with wonderful and memorable (dare I say “sticky”?) anecdotes that illustrate every principle. The book offers fresh strategies and fresh tools for making better choices. The first thing I am going to do now that I have read Decisive is have everyone on my team read it. I can’t imagine anything that could impact the quality of our lives and business more than making better decisions. I gave away 100 copies of Decisive. To qualify, my readers had to comment below. You can find the list of winners here. Question: What appeals to you about this book and why do you want a copy?